Since I have been blogging, I have read thousands (daily) of posts from different blogs that seem to come and go. There are very few blogs that have been around as long as Kathy Shaidle at Five Feet of Fury and have maintained such a large footprint. I think she has been blogging since 2000, maybe? 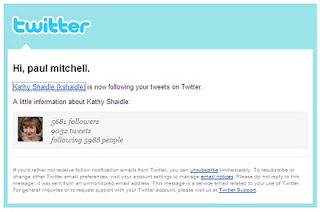 Imagine my surprise when I got home today and THE Kathy Shaidle was following me on Twittah. I promise that I am going to start my damn Twittah feed going again, really soon. I have not completely quit using the service, I just got kinda tired of seeing the same stuff over and over again, but the service RAWKS. Where else can you have a conversation with Right Girl, Stacy McCain, and Michelle Malkin all in the course of ten minutes? Anyhoo, read Kathy's blog and follow her on Twittah, she is the bees knees. TD, this is odd...not that Kathy follows you. I added her URL on my Google Reader, and it shows me her posts from Oct. 2007...nothing current. Well, maybe it'll work itself out. Dang, Andy, the top one on her page says January 15, 2010 for me. Maybe the feed is not updated because she wants COMMENTS! HA! Skunks, I got kinda sick of Twittah a little while back because there were so many retweets of the very same stuff. I looked at it for a while last night and it is better, but not where it was when I started. Maybe I am not doing it right. Ya' know, you might be right. I tried to reinstall the feed, with same results. I see what it is, you are letting Google Reader add the feed. Try this one, instead. Check! Done! Thanks once again, dude. I don't know how that crap works. I saw that, at least Rocky Top and UGA don't have a big rivalry, huh? What was he, the fourth choice? I don't know what choice # he was. But, I like the guy. He's done a good job in Ruston...though the W/L was not so sporty last season...many CLOSE losses. I have often thought that the head job at LA Tech & AD (as he was) would be the best job in the game. Nice town, nice people, not too much expected...the good life. But, it ain't the SEC, and I reckon he wants a shot at the big-time. At least he's going in with his eyes wide open. I'll be pulling for him. I like the guy.